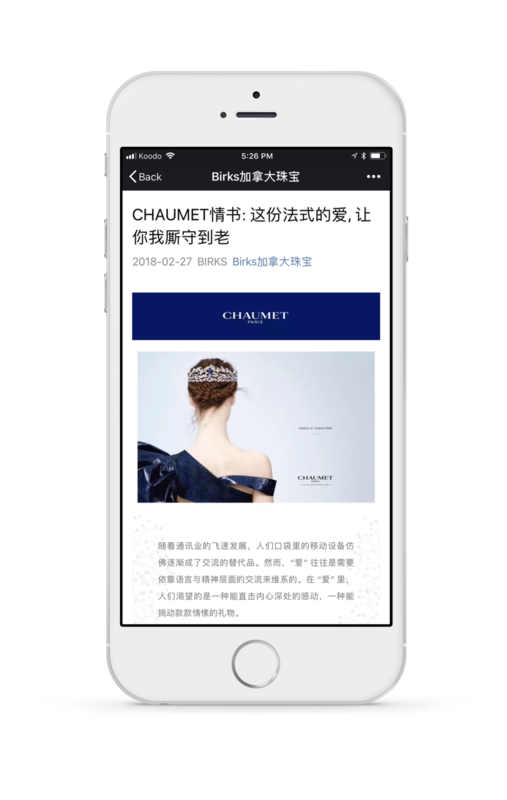 While most of the popular WeChat platforms you see may be news-oriented and push out articles on a daily basis that are text heavy, with numerous paragraphs of copy supported by 5-6 visuals, the opposite is true for high-end brands, where the tendency is to focus on the visual design and the product versus large amounts of copy. 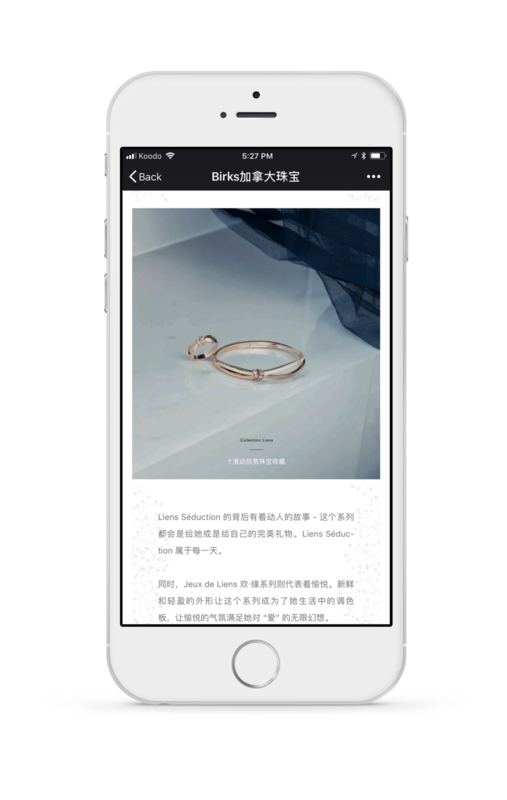 Our client Maison Birks, Canada's Diamond and Fine Jewellery Leader, recently started to market their presence on WeChat, and our team helped them craft a content strategy tailored for the affluent Chinese audience, which is their key target demographic. We prepared 3 advertorial write ups for 3 different brands, the Birks Iconic and Snowflake collections, Van Cleef & Arpels, and Chaumet Paris. Princess-to-be Meghan Markle has been a long-time fan of the brand, and we leveraged this great endorsement to showcase her wearing Birks jewellery to numerous royal outings and for her official engagement announcement. The article was very well received by the audience, outperforming the average number of views by as much as 3 times. For Chaumet Paris we featured various top-tier Asian celebrities wearing their Joséphine collection for their wedding vows. The most revered couple followed by millions in China was Angelababy and her husband Huang Xiaoming, where Angelababy wore a vintage Chaumet tiara and necklace along with a Joséphine collection wedding ring. The article outperformed average articles by 3 times the normal traffic. For the Birks brand we ensured the article layout and design adhered to the brand standards for each brand, working with Birks and their brand vendors to obtain approval at each step. An understanding of the work process for our clients and appreciation for the importance of brand presentation on different platforms is what helps our work perform better than average. Get in touch with us today to find out how we can help your brand build a successful presence on WeChat!